5 guys - 3 bikes - 1 SUV - 1 Trailer, are touring for a cure for cancer...and oh by the way... they just graduated from college and chose a superbly spectacular way to give back this summer. In there own words - "We are cycling 3,380 miles in 36 days to raise money & awareness for Cancer Research. Beginning in MN and ending in FLA. We hope you will support our effort by making a donation to support the American Cancer Society!" Now that's a Spirited expression of gratitude! 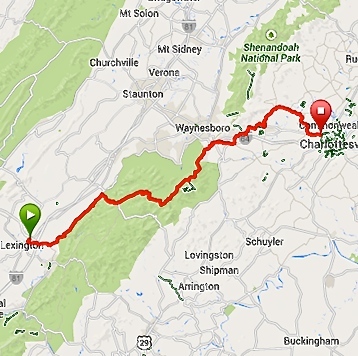 Starting in Lexington, our day was already going to be one of the toughest of the trip having to climb Mt. Vesuvius, which meant 6,600 feet of climbing, however we decided to combine tomorrows 31 miles into todays ride in order to have an off day tomorrow. It was pretty cool outside today which helped. The views on the overlooks were absolutely amazing as well! With an off day tomorrow, we have decided to visit Washington, D.C. to see all that the Capitol has to offer!